The smell of fresh crisp paper. 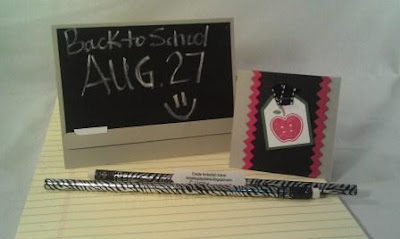 Oh yeah, its back to school time! I have been sitting on these Chalk board sheets for some time now, and finally its time to use them! 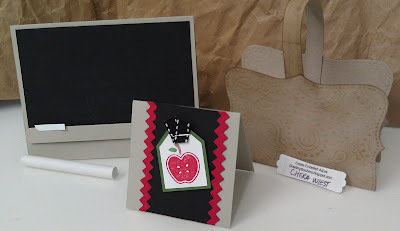 I paired my chalkboard card with a cute little Top Note basket. And finally a 3 x 3 notecard to complete the gift ensemble. Thank you for stopping by! Hug the ones you love. Have a great day! 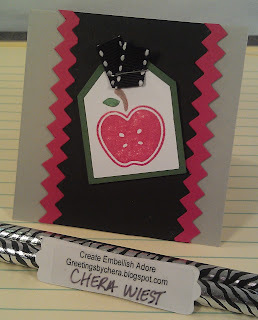 OMG, how cute is your little chalkboard? Super cute! Adorable Chera! I bought the Dec. Elements from SU before they went out so I could communicate with my kids (I work the night shift and they're in high school! ), but a small portable chalkboard to leave a note to remember lunches etc. is adorable! !